TopBot Mini uses the VSA Multi-Platform Charting Package to identify the most highest probability trades in any time-frame or market. 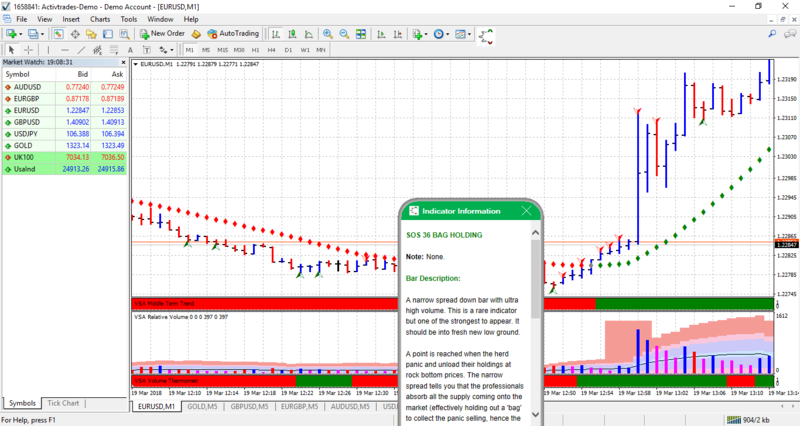 A complete mix of software tools, scanners and a complete rules-based trading solution. The System now automatically emails you trading signals direct from the chart. This strategy does NOT require SMART technology. TopBot Mini uses the VSA Charting Package to identify the most highest probability trades in any time-frame or market. 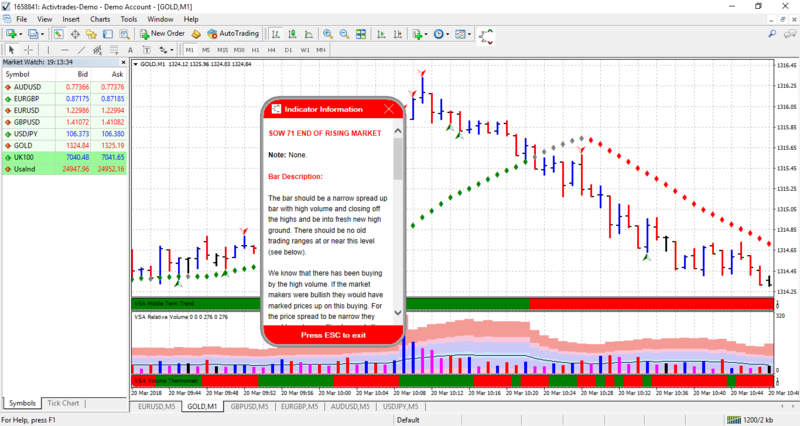 A complete mix of software tools, scanners and a complete rules-based trading solution which emails you trading signals direct from the chart. In the Wyckoff / Volume Spread Analysis methodology there are FIVE signs of strength and SIX signs of weakness that mark the top and bottom of a trend in the time-frame that they appear in. These extremely powerful signals will mark the start of the distribution phase or the start of accumulation phase which highlight a trend reversal . The new TopBot Mini Wyckoff / Volume Spread Analysis trading strategy is completely counter trend and requires no confirmation if you are trading the aggressive strategy which only requires the next bar after the indicator has triggered to close higher or lower than the closing price of the indicator bar to trigger a short or long trade immediately the price bar after the signal indicator has closed. The new strategy has now been programmed into the VSA Charting Package and has been tested extensively by Gavin Holmes, Head Trader at Wyckoff / Williams Investment Portfolio Fund. The aggressive strategy immediately alerts the trader or investor to a trade set up when End of a Rising Market or Bag Holding Appears, and although these indicators are rare, the software scans multiple time frames in multiple markers meaning hundreds of charts are sniffing and alerting out these major indicators. The time frames we use in this new strategy are suitable for scalp trading, swing trading and investment trading. If one of these 11 indicators is detected in a weekly, daily or four hourly chart, the probability of a major market move of between 5% and 8% over a four week period becomes extremely likely. Alerts are generated by the software automatically via an email alert sent to your chosen device. Below are two recent examples in the Spot FOREX market using 1 minute time frames, but these signals can also be found in stocks and futures markets as well worldwide in all markets with volume. Shows false breakouts to the upside and downside as the market is marked up and down by "Smart Money"